Derry city courthouse has been apparently targeted tonight in a car bomb attack. The shock bombing in Bishop Street is being linked to the ‘new IRA’, its first such attack in years. 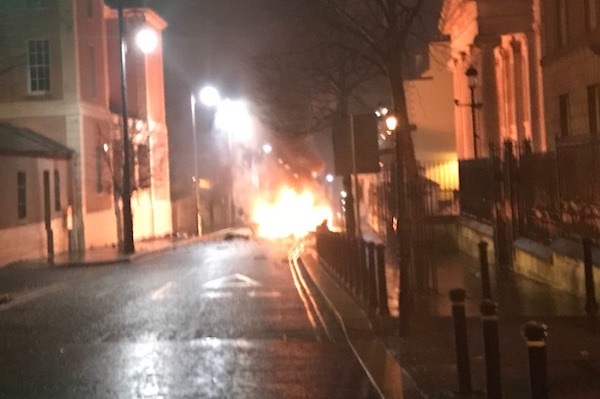 The PSNI tweeted an image of the explosion near the city’s courthouse on Bishop Street. Internet posts by hardline republican party Saoradh pointed out that the “mine attack” had taken place on the centenary of the first attack of the War of Independence, in 1919. Sinn Fein’s Elisha McCallion, condemned the attack and said she believed nobody had been injured.